We see a lot of beach sunset pictures here at Hawaii Picture of the Day. This one stands out. The combination of framing, saturation, motion, and colors is fantastic. 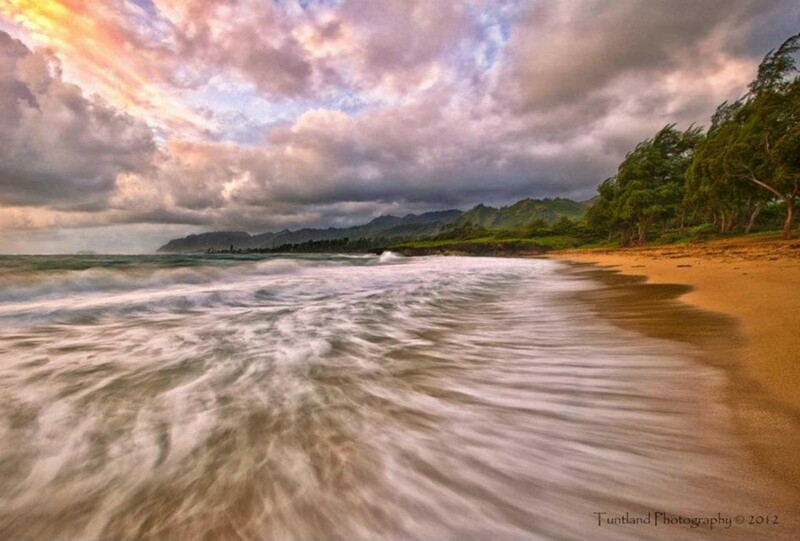 Taken on the shores of Oahu, the longer shutter-speed gives us a sense of the waves while making the ocean appear to be painted rather than photographed. Lest we be fooled, the beach, trees, and mountains in the background are in sharp detail. From sea to summit, and ocean to land, Oahu–and Hawaii in general–seems to reconnect us to our sense of awe and wonder for life. Well, when you are ready we look forward to hearing the background to this watercolor-esque photo. From the age of 12, I have had a camera in my hand. My love for photographic art, was first sparked by my father’s old Pentax K1000 (a fully manual, 35mm). It remained my instrument of choice for several years. Although I am yet a young artist, there have been a couple turning points in my career that have directed my path. Growing up without mainstream television, paved the way for a “hands on” approach to life. Mechanical ability and love for the outdoors, grew as a result. The first real turning point, was selling my hot rod, to purchase my first digital SLR. The second was a complete loss of sight in my dominant eye. It sounds cliché, but the phrase, “You don’t know what you have, until it’s gone” never rang more true. Thanks to the grace of God, and the support of those around me, I have 100% of my sight back.